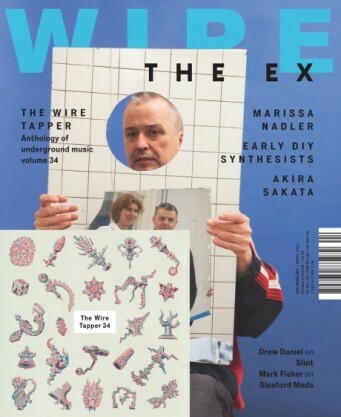 The Ex are the cover stars of the latest issue of The Wire (April, 2014). Pick up a copy and read about Daniel Spicer travels to Amsterdam to talk DIY survival strategies with the Dutch ethno-improv-punk collective. 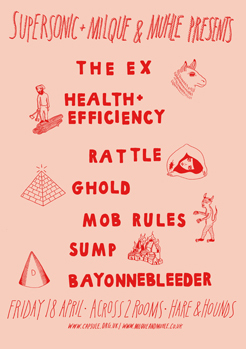 Don’t forget you can catch The Ex right here in Birmingham at Hare & Hounds on April 18th for just £10 (adv.). That’s a bargain all by itself, but we’ve teamed up with Milque & Muhle to put on 6 more up and coming bands for you to check out too. That’s right, two stages, 7 bands, all for a tenner. Investigate the full line-up below. Tickets here. Formed back in 1979, Terrie (guitar), Sok (vocals), Geurt (drums), and René (bass) choose their instruments by drawing straws to decide who would play what, starting from scratch. The name was chosen based on the fact that it could be sprayed on a wall in two seconds flat! Since those early days the band have worked across so many musical styles and with so many artists that categorizing their sound to any one genre seems almost unfair . For more band history read here. H&E thrive on an instinctive and experimental approach to the creation and composition of their music. Eschewing traditional songwriting and structural techniques in favour of a process of improvisation, editing, refinement and distillation of their sound working together as a democratic unit. Proponents of self-sufficiency and independence, their recordings to this point have been engineered and mixed by friends and more recently by the band themselves at their practice space, then released via the internet. Unhindered by a desire, or need, to be restricted to a specific genre, HEALTH & EFFICIENCY create a sound of unrestrained eclecticism. string of releases under their belt, which considering their 2 years together, is pretty impressive. Formed in 2008, SUMP is a Yorkshire two-piece consisting of George Proctor (guitar) and Gareth Howells (drums and vocals). In the short time they’ve been together they’ve managed to release numerous 7″ splits and demos as well as cassettes on their own labels, Dead Tapes and Turgid Animal. 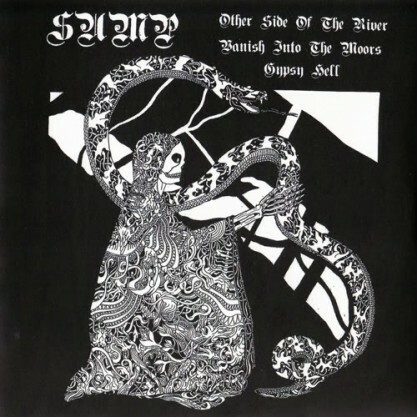 SUMP is a glorious fusion of Black Metal and Punk, this isn’t the first time the two have come together, yet somehow SUMP achieve a unique and exciting sound. refining their tight and rapid sound; They take influence from bands such as Rorschach, Septic Death and His Hero Is Gone. Originally one drummer, guitarist, bass and vocalist they’ve recently made the addition of a second guitarist, to reach their heaviest potential. Expect a short and intense set of 10 tracks lasting 20 minutes. For tickets go here, you know you want to.